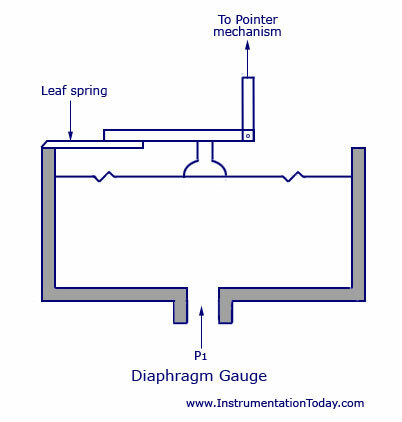 A capacitance pressure transducer is based on the fact that dielectric constants of liquids, solids and gases change under pressure. The figure below shows an arrangement of a cylindrical capacitor that can withstand large pressure. As the change in dielectric constant is quite small (only about ½ percent change for a pressure change of about 10 MPa), it is usable only at large change in pressure. Besides, the capacitance-pressure relation is non-linear and is affected by temperature variation. 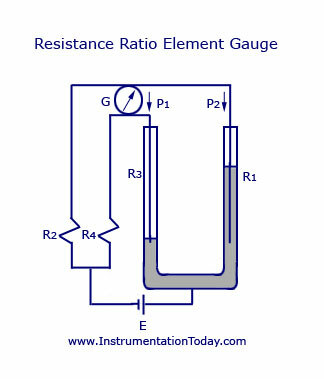 The measurement of this capacitance is done by a resonance circuit. The schematic is shown below. The oscillogram giving the variation of the output voltage with capacitance is also shown below. Such transducers are frequently used in pressure transmitter. As fibre-optic type pressure measurement is versatile in many applications fields, it is gradually becoming popular. Its adaptability in bio-medical area has also been confirmed in which case, it can be used to monitor pressure in the human circulatory system. The basic diagram of the system is shown below. There are two optical fibre bundles called guides – input and output – arranged as shown in the end view, giving the proper perspective. Chopped light from source is focused on to input guide, which on emergence is reflected from a flexible membrane. The membrane may be made of aluminized plastic formed as a film. With pressures, P1 and P2 equal, the position of the membrane with respect to the input guide is so kept that 50% of the reflected light falls on the surrounding annular output guide. With P2 greater than P1, the membrane becomes convex towards the guides and more light falls on the output guide, while with P1 less than P2, the reverse occurs. A detector set at the other end of the output guide correspondingly receives varied amount of light with changing pressure. The detector can be calibrated for pressure. A surface acoustic wave (SAW) delay line, consisting of two inter-digital transducers (IDT) when stretched along the propagation direction or bent as a cantilever beam, its substrate becomes stressed causing an elongation of the substrate, in turn, causing an increase in the centre-to-centre distance between the two IDT’s. High stress also changes the material and its elastic constants causing the velocity Vs of the surface acoustic wave to change. This change can also be brought by change in temperature, pressure, force, and the delay line can thus be used as sensors for temperature, pressure, force, displacement, and so on. One method of using the delay line as a practical sensor is to introduce it in the feedback path of an amplifier to obtain an oscillator with its frequency as a function of the stress. The figure is shown below. As in most devices, temperature affects the performance by changing the property of the material. However, every quartz crystal cut appropriately has a turnover temperature at which the effect of temperature is minimum. Also, if surface wave is proportional on both faces of the substrate using two pairs of IDT’s, the sensitivity increases and effect of temperature is reduced. Bourdon Tubes are known for its very high range of differential pressure measurement in the range of almost 100,000 psi (700 MPa). It is an elastic type pressure transducer. The device was invented by Eugene Bourdon in the year 1849. The basic idea behind the device is that, cross-sectional tubing when deformed in any way will tend to regain its circular form under the action of pressure. 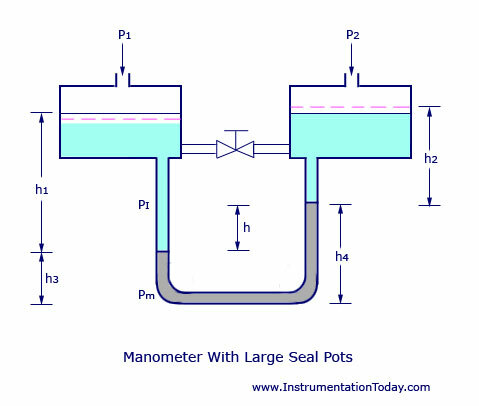 The bourdon pressure gauges used today have a slight elliptical cross-section and the tube is generally bent into a C-shape or arc length of about 27 degrees. The detailed diagram of the bourdon tube is shown below. As seen in the figure, the pressure input is given to a socket which is soldered to the tube at the base. The other end or free end of the device is sealed by a tip. This tip is connected to a segmental lever through an adjustable length link. The lever length may also be adjustable. The segmental lever is suitably pivoted and the spindle holds the pointer as shown in the figure. 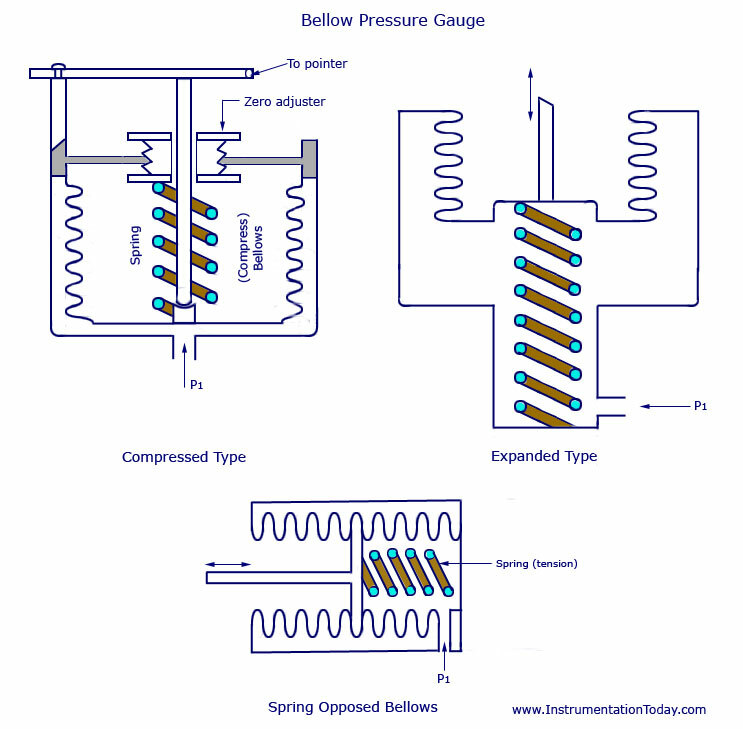 A hair spring is sometimes used to fasten the spindle of the frame of the instrument to provide necessary tension for proper meshing of the gear teeth and thereby freeing the system from the backlash. Any error due to friction in the spindle bearings is known as lost motion. The mechanical construction has to be highly accurate in the case of a Bourdon Tube Gauge. If we consider a cross-section of the tube, its outer edge will have a larger surface than the inner portion. The tube walls will have a thickness between 0.01 and 0.05 inches. 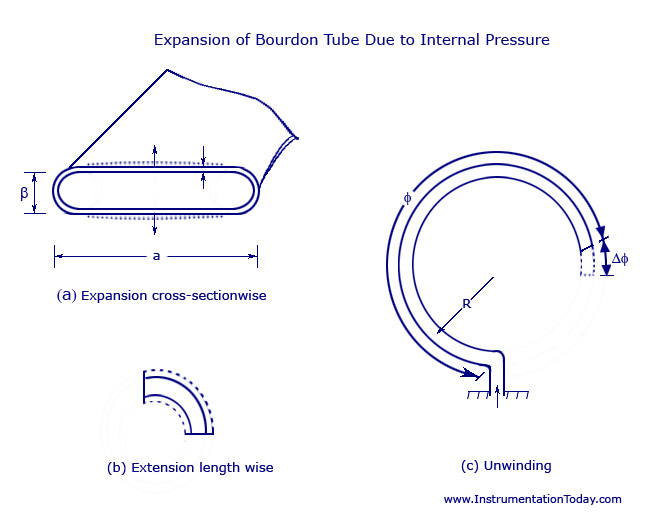 As the fluid pressure enters the bourdon tube, it tries to be reformed and because of a free tip available, this action causes the tip to travel in free space and the tube unwinds. The simultaneous actions of bending and tension due to the internal pressure make a non-linear movement of the free tip. 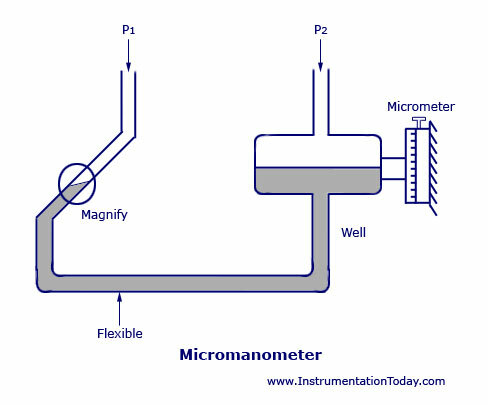 This travel is suitable guided and amplified for the measurement of the internal pressure. But the main requirement of the device is that whenever the same pressure is applied, the movement of the tip should be the same and on withdrawal of the pressure the tip should return to the initial point. A lot of compound stresses originate in the tube as soon as the pressure is applied. This makes the travel of the tip to be non-linear in nature. If the tip travel is considerably small, the stresses can be considered to produce a linear motion that is parallel to the axis of the link. The small linear tip movement is matched with a rotational pointer movement. This is known as multiplication, which can be adjusted by adjusting the length of the lever. For the same amount of tip travel, a shorter lever gives larger rotation. The approximately linear motion of the tip when converted to a circular motion with the link-lever and pinion attachment, a one-to-one correspondence between them may not occur and distortion results. This is known as angularity which can be minimized by adjusting the length of the link. Other than C-type, bourdon gauges can also be constructed in the form of a helix or a spiral. The types are varied for specific uses and space accommodations, for better linearity and larger sensitivity. For thorough repeatability, the bourdon tubes materials must have good elastic or spring characteristics. The surrounding in which the process is carried out is also important as corrosive atmosphere or fluid would require a material which is corrosion proof. The commonly used materials are phosphor-bronze, silicon-bronze, beryllium-copper, inconel, and other C-Cr-Ni-Mo alloys, and so on. In the case of forming processes, empirical relations are known to choose the tube size, shape and thickness and the radius of the C-tube. Because of the internal pressure, the near elliptic or rather the flattened section of the tube tries to expand as shown by the dotted line in the figure below (a). The same expansion lengthwise is shown in figure (b). The arrangement of the tube, however forces an expansion on the outer surface and a compression on the inner surface, thus allowing the tube to unwind. This is shown in figure (c). Like all elastic elements a bourdon tube also has some hysteresis in a given pressure cycle. By proper choice of material and its heat treatment, this may be kept to within 0.1 and 0.5 percent of the maximum pressure cycle. Sensitivity of the tip movement of a bourdon element without restraint can be as high as 0.01 percent of full range pressure reducing to 0.1 percent with restraint at the central pivot.